Posted at 9:14 am by Yummytums! Anyone who has read my posts about green smoothies knows that I’m a big believer in their health benefits. Unfortunately, getting people to try one for the first time is often the biggest obstacle. But believe me, you shouldn’t be afraid of this recipe! Even my non-green-smoothie drinking husband liked this one and drank the whole thing with nary a complaint. In fact, he really enjoyed it. This is a great starter recipe for anyone who’s interested in dipping their toes into the proverbial green smoothie pond. It tastes more like a cherry slushy than anything green. 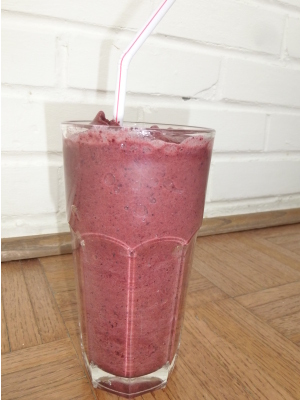 You can find most of the ingredients for the Cherry Top Green Smoothie in the frozen fruits section of your supermarket. I always recommend buying organic frozen fruits if you can, but I occasionally buy conventional, as well. And, as a side note, you can freeze your own bananas. I do this all the time and they’re perfect for smoothies. If you have bananas that are on the verge of becoming overripe, just peel them, break them into pieces, put them in a freezer-safe container or Ziploc bag and pop them in the freezer. They’ll keep for weeks that way. As for the greens, when I don’t get them fresh from my friends at Beyond the Bridge, I purchase organic greens in the plastic tubs at my local Kroger store. I’ve found that the ones in the clear tubs tend to last longer than loose leaf greens. Place water, spinach and protein powder in a high-speed blender. Follow with your fresh and/or frozen fruits. Blend on high for 30 seconds or until you reach the consistency you desire. This smoothie is packed with potassium, vitamins A, B6, C, D and E. It also contains copper, folate, magnesium and manganese, as well as other minerals.